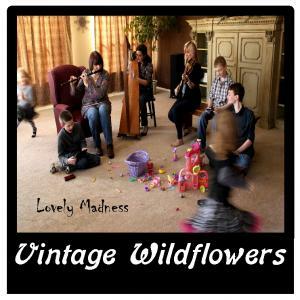 The latest album from Vintage Wildflowers is hot off the press! 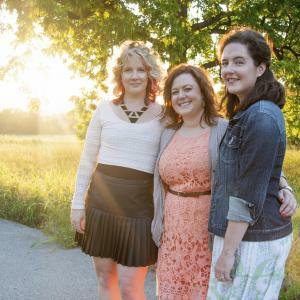 Available on iTunes and CD Baby as of June 19, 2014, "In Full Bloom" features our mix of three-part harmonies, backed by fiddle, Celtic harp and bass. It also features guest artists Scott Schmidt, Wendy Songe and Bridget Carroll. Recorded at A.R.C. Recording Studio. Mixed and Mastered by Walt Bowers. 5. Fisherman's Set - LISTEN BELOW! 6. I Am Stretched On Your Grave - LISTEN BELOW! "This is an album you'll want in your collection." - FanRealm review of "Lovely Madness"
Released March 2011. Produced, mixed and mastered by Don Schiavone. Recorded at Cow Cube Studios in Tulsa, OK. Additional instrumentals by Don Schiavone (guitar, piano, bass). All tunes and songs traditional, unless otherwise noted. 1. In My Prime - LISTEN BELOW! 4. False Lady - LISTEN BELOW! Fisherman's Set - featuring Scott Schmidt on mandolin. Tunes in this set are Fisherman's Favorite, Fisher's Hornpipe and Morpeth Rant. As Audrey likes to say, a true song of love and devotion... "I Am Stretched On Your Grave" is one of our favorite songs and is featured on both Lovely Madness and In Full Bloom. The re-mix for In Full Bloom features our friend, vocalist Bridget Carroll. One of our favorites - but a little dark in theme. There's a murder by the time you get to the 3rd verse...from "Lovely Madness". The first track on "Lovely Madness". The first track on "The Upstairs Sessions". One of our favorite songs - and one of the most haunting. No Longer Available - SOLD OUT!!! 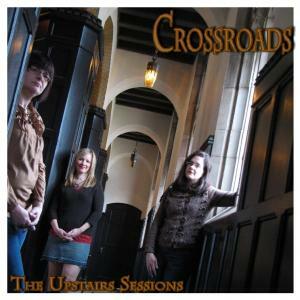 The Upstairs Sessions is the debut CD from Vintage Wildflowers under the band's former name, Crossroads. Released March 2010. Produced, mixed and mastered by Don Schiavone. Recorded at the University of Tulsa's Tyrrell Hall. All tracks traditional, unless otherwise noted. Go to CD Baby, iTunes and Amazon.com to purchase and download digitally. You can also purchase at any of our gigs. See ﻿SCHEDULE﻿ to find out where we'll be performing next. Copyright 2016 Vintage Wildflowers. All rights reserved.